The dog stepped on the transmission switch to back the 38-foot RV down the boat ramp. A professional fisherman got a big surprise as he tried to launch his boat at Lake Sam Rayburn to practice for a fishing tournament this past weekend. Eric Jackson, of Rock Island, TN, told 12News his two-year-old Dalmatian, Bodi, stepped on the gear shift switch, putting the 38-foot RV in reverse. Jackson says he was on the back bumper unloading his boat when the RV began backing into the lake. Jackson had been working to launch his boat at the ramps at the Umphrey Family Pavillion of Highway 255. He was planning a practice day before the Fishing League Worldwide 2019 Tour when the mishap occurred. In the video, Jackson can be seen trying to run around the side of the RV to stop it from going into the water. "By the time I got my foot on the brake, the back wheels were floating," Jackson said. Jackson shared a video he took while scrambling to get inside the RV on his Facebook page. 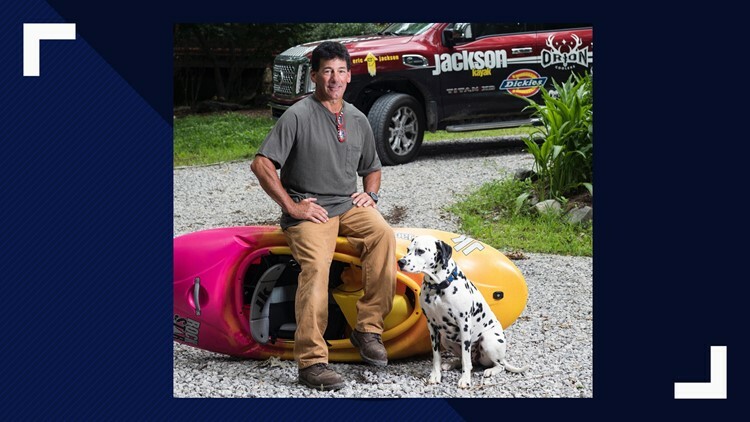 When Jackson isn't fishing professionally he runs Jackson Kayak and Orion Coolers in Sparta, TN. Eric Jackson, of Rock Island, TN, and his 2-year-old Dalmatian, Bodi. Christian Corley of YOLOtek captured the entire mishap on video. His company website says its mission is to "build awesome products to help you catch video of your once-in-a-lifetime moments."